You are here: Home / What is Mead? Mead, also commonly referred to as honey wine, is a type of fermented alcoholic drink. The alcoholic content is usually found within the 8-20% range. It is actually believed to be the first beverage to be fermented, beating out beer and wine which each have a slightly more complex process to create. While it’s not definitive, as all of them were available in prehistory, we do have records of a notable surge in the creation of beer and wine a bit later in history that helps support mead being an older beverage. more than 50% of the fermentable sugar. This is what the yeast eats to turn into alcohol. Comparatively, wine uses the juice of grapes, and beer uses sugars from grains and hops. But that’s just the base ingredient. 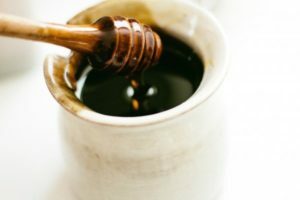 While all you really need to make mead is honey, water, and some yeast, there’s thousands of other ingredients you can add to differentiate it. There is a ton of variety that can be added to the beverage, giving it a breadth of flavor profiles that are quite diverse from one another. In addition, mead can be carbonated or still, and can span the entire spectrum of dry and sweet. 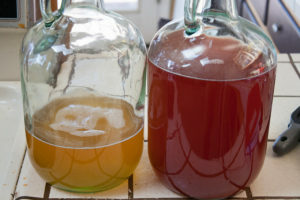 Melomel – Mead with a fruit, or berry addition. Often made as a sweeter variety. This form is very similar to grape wines in appearance and texture. As if one subcategory wasn’t enough, certain fruits were popular enough to spawn their own name. Pyment – This is a mead brewed with the addition of grapes or grape juice. Cyser – A very popular combination. Apples are another one of the fruit additions that have their own alcohol type when brewed alone. This one will often resemble a cider, but could come out wine-like as well depending on the yeast used. Metheglin – A mead that contains spices or herbs. Commonly used examples are cloves, cinnamon, nutmeg, or lavender, meadowsweet, and chamomile. Acerglyn – A maple syrup addition to the honey. Bochet – The honey is caramelized or burned prior to fermenting. This creates flavors closer to toffee, chocolate, caramel, or toasted marshmallows. Braggot – This is a mead brewed with hops, or malt. The result resembles beer a bit more closely than the other varieties. Capsicumel – A spicy variety flavored with peppers. Brewing of mead is actually a fairly simple process that you can easily do at home. I’ll go over the basics here. The bare essentials required are a sterilized container, 2-3 pounds of honey per gallon of mead you intend to create, a source of yeast (preferably a brewing yeast, although recipes exist that make use of bread yeasts but these don’t have as high an alcohol tolerance and will likely die off before they finish eating all the sugars leaving it very sweet with a low alcohol by volume. Also likely a more yeasty flavor imparted to the mead), and enough water and/or juice to fill the rest of the target volume. As this mixture will attract fruit flies, the bare minimum to cover this container would be a cheesecloth. Fermentation also produces carbon dioxide as a byproduct, so you should NOT brew in a completely sealed container. The gas will find a way to escape somehow, often in an explosive manner. Many homebrew hobby stores sell airlocks purpose built to allow gas out but prevent anything from getting in. Blow-off tubes are another way of allowing the gas to escape. Depending on the size of your container, and what you are brewing, the fermentation can become quite vigorous. So the smaller the escape route for the gases, the more likely you are to have a geyser (I prefer to do the initial fermentation in a bucket for this reason – I’ve yet to have a blow-out, but have seen many pictures of other brewers painting their ceiling with an especially feisty ferment with very little headspace in the container and a small bottle neck for the escape route). For a more in depth description of how to make mead, check out the beginner and intermediate guides. Like everything worth doing, we have different metrics for judging the final result so we can prove who did it best. The following are the characteristics that the BJCP (Beer Judging Certification Program) outlines as worth paying attention to. There are three levels within this category: dry, semi-sweet, and sweet. The sweetness of a mead is merely referring to the amount of sugar left in it. This is not to be confused with fruitiness which can still be exhibited by a dry mead. Sweetness also tangentially relates to the body (thickness, or how it feels in your mouth) of a mead, but dry meads are still able to have some body to them. Tannin is capable of making the perceived sweetness of a mead seem drier than it is. Identifying the sweetness level is generally just used in aiding the ordering of a flight of several drinks. Differences from the stated sweetness level are not considered worth heavily penalizing in competitions. Again, this category has three levels to it: still, petillant, and sparkling. Still meads range from flat to a very light bubbling. Petillant meads have a light sparkling and generally a noticeable amount of carbonation. Meanwhile, sparkling meads can range up to something akin to champagne or carbonated water. Minor differences from stated levels of carbonation are not grounds for heavy penalization in competitions, either. This category’s three levels: hydromel, standard, or sack. The strength of a mead is in reference to the amount of alcohol in it (indirectly about the amount of honey and other fermentable sugar that was used to created it). Stronger meads also tend to display stronger characteristics of the honey used to brew it. Higher quality strong meads may be difficult to notice how strong they are. This tends to deal with age and the rapidness in which the fermentation took place. The faster and more recent the fermentation, the more harsh fusel alcohols will be present. These will fade with age. Some honeys are quite unusual and additional information can be helpful for the judges to determine how well these characteristics come through in the mead. For more information on honey varietals, click here. Different styles of mead can include a wide variety of other ingredients ranging from fruit, spices, malt, and more. In competitions, these ingredients must be made known to the judges for proper evaluation. In addition, Oak fall sunder this category, but is not required to be specified. However, over-oaking is to be penalized, much as it is in wine judging. Now that you know some of the attributes of mead, you need to know how to describe what you’re tasting to properly judge it. Clarity may be good to brilliant. Crystal clear, reflective examples with a bright, distinct meniscus are highly desirable. Observable particulates (even in a clear example) are undesirable. Carbonated examples have a short-lasting head similar to Champagne or soda pop. The components of bubbles or head will vary greatly depending on the carbonation level, ingredients and type of mead. In general, smaller bubbles are more desirable and indicative of higher quality than larger bubbles. The color may vary widely depending on honey variety and any optional ingredients (e.g., fruit, malts). Some honey varieties are almost clear, while others can be dark brown. Most are in the straw to gold range. If no honey variety is declared, almost any color is acceptable. Hue, saturation and purity of color should be considered. Stronger versions (standard and sack) may show signs of body (e.g., legs, meniscus) but higher carbonation levels can interfere with this perception. Stronger or sweeter meads may have a stronger honey aroma than drier or weaker versions. Different varieties of honey have different intensities and characters; some (e.g., orange blossom, buckwheat) are more recognizable than others (e.g., avocado, palmetto). The aromatics may seem vinous (similar to wine), and may include fruity, floral, or spicy notes. The bouquet (rich, complex smells arising from the combination of ingredients, fermentation and aging) should show a pleasant fermentation character, with clean and fresh aromatics being preferred over dirty, yeasty, or sulfury notes. A multi-faceted bouquet, also known as complexity or depth, is a positive attribute. Phenolic or diacetyl aromatics should not be present. Harsh or chemical aromatics should not be present. Light oxidation may be present, depending on age, and may result in sherry-like notes, which are acceptable in low to moderate levels (if in balance, these can add to complexity). An excessive unbalanced sherry character is a fault. Oxidation resulting in a papery character is always undesirable. Alcohol aromatics may be present, but hot, solventy or irritating overtones are a defect. The harmony and balance of the aroma and bouquet should be pleasant and enticing. Stronger, sweeter meads will have a stronger honey flavor than drier, weaker versions. Different varieties of honey have different intensities and characters. The residual sweetness level will vary with the sweetness of the mead; dry meads will have no residual sugar, sweet meads will have noticeable to prominent sweetness, semi-sweet meads will have a balanced sweetness. In no case should the residual sweetness be syrupy, cloying or seem like unfermented honey. Any additives, such as acid or tannin, should enhance the honey flavor and lend balance to the overall character of the mead but not be excessively tart or astringent. Artificial, chemical, harsh, phenolic or bitter flavors are defects. Higher carbonation (if present) enhances the acidity and gives a “bite” to the finish. The aftertaste should be evaluated; longer finishes are generally most desirable. A multi-faceted flavor, also known as complexity or depth, is a positive attribute. Yeast or fermentation characteristics may be none to noticeable, with estery, fresh and clean flavors being most desirable. Alcohol flavors (if present) should be smooth and well-aged, not harsh or solventy. Light oxidation may be present, depending on age, but an excessive sherry-like or papery character should be avoided. Aging and conditioning generally smooth out flavors and create a more elegant, blended, rounded product. Flavors tend to become more subtle over time, and can deteriorate with extended aging. Well-made examples will often have an elegant wine-like character. The body can vary widely, although most are in the medium-light to medium-full range. Body generally increases with stronger and/or sweeter meads, and can sometimes be quite full and heavy. Similarly, body generally decreases with lower gravity and/or drier meads, and can sometimes be quite light. Sensations of body should not be accompanied by an overwhelmingly cloying sweetness (even in sweet meads). A very thin or watery body is likewise undesirable. Some natural acidity is often present (particularly in fruit-based meads). Low levels of astringency are sometimes present (either from specific fruit or spices, or from tea, chemical additives or oak-aging). Acidity and tannin should be used to help balance the overall honey, sweetness and alcohol presentation. Carbonation can vary widely (see definitions above). High carbonation will enhance the acidity and give a “bite” to the finish. A warming alcohol presence is often present, and this character usually increases with strength (although extended aging can smooth this sensation).